The details for Tiger’s second round at the Farmers Insurance Open, where he needs to go low on Friday at Torrey Pines. It’s the first football-free weekend since August and Tiger Woods is here to try and fill the void. Maybe? Sorta? Just a little bit? There is no substitute for football when it comes to the interest of the American sports fan. Tiger Woods is maybe the most famous athlete on the planet, but he’s not coming close to occupying that interest, and he sure as hell is not doing it at the Farmers Insurance Open. But! It’s not the worst substitute and Tiger is back to being a real, competitive golfer that can win again on the PGA Tour. His last official start on Tour was a win, one that completed one of the greatest comebacks in the history of sports. His first start of 2019 began well enough with a 2-under 70 on Torrey Pines’ more difficult South Course on Thursday afternoon. Woods did nothing excellent or startling, he just played well from tee-to-green and made some putts at the par-5s. The leaders, who played the easier North Course, raced out some seven and eight shots ahead of him. But Tiger’s round was steady and maybe even what we expected, which is a far cry from last year’s Farmers, when we just wanted to see him break 80 and not have his fused back disintegrate while hacking some ball out of the rough. 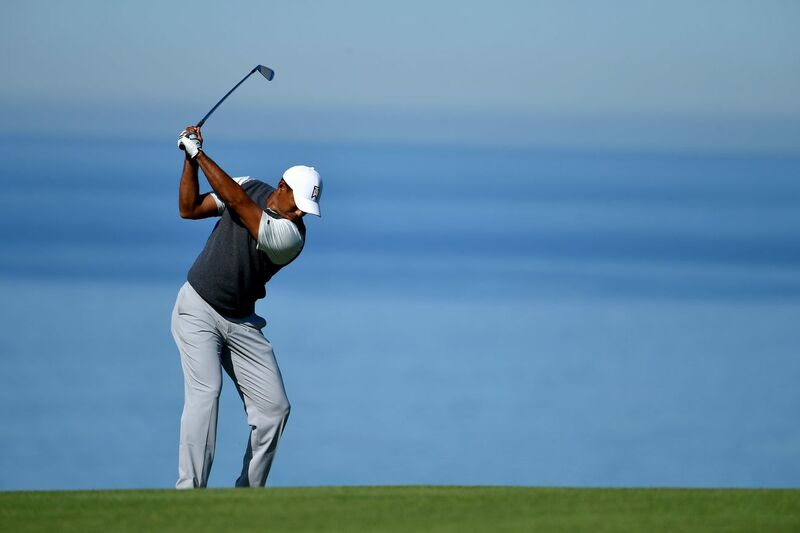 Tiger returns Friday and will get the easier North Course knowing he needs to get aggressive and post a low number if he has any plans on winning at Torrey for an absurd 9th time in his career. It was on the North that Jon Rahm went out in 29 and finished with a 10-under 62. Tiger struck the ball well, drove it better than we’re used to seeing here, and putted fine enough on Thursday to give you the impression that he could pull together some low number to rocket up the leaderboard. So that should be a fun watch on Friday afternoon. Here are some of the nuts and bolts for Friday’s second round in San Diego. It’s hard to have full field events on just one course this time of year with the limited daylight. Those that do, notably at Riviera and Phoenix, often fail to finish before dark on Thursday and Friday. So the full 36-hole complex at Torrey Pines is put to use for the first two days and it gives the Tour plenty of cushion to set the tee sheet. In fact, almost the entire field is in action at once, as they utilize threesomes off four separate tees. Tiger moves to the North Course on Friday. It is traditionally the easier course but the disparity between it and the South Course had supposedly been narrowed after a Tom Weiskopf redesign a few years ago. In Round 1, however, the South Course was a brute comparatively, with a scoring average almost two strokes higher than that half of the field that played the North. Almost every player on the first page of the leaderboard played on the North Course. You can view a full tee sheet for the second round here. The party is over if you’re not a subscriber to NBC Sports Gold’s OTT service. On Thursday, as part of NBC Gold taking the reins of PGA Tour Live distribution, NBC offered a “sneak peek” of the service on Golf Channel. So you could watch that stream, mostly of Tiger’s first round, for free on Golf Channel.